Small hanging capacitor omni-directional microphone for unobtrusive stage use. The BM 180 stage microphone is a compact member of the micon series of studio condenser microphones. 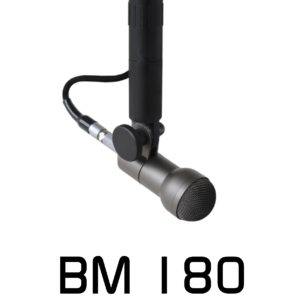 The BM 180 comprises a BMK 180 omni-directional microphone capsule and the BMV 190 microphone preamplifier. A classic 48V phantom powered condenser microphone design, the BM 180 ensures a high degree of intelligibility and clarity for speech, vocals and music.